I made a small amount of carrot and rosemary oil to use in the herbal hand balm tutorial, but this batch of carrot oil is just for me! It should last me all summer, for the various herbal remedies and creams I plan to make. It’s very simple to do: you just pack a kilner jar with grated carrot (about 4 large carrots) and cover with olive oil (about 500ml). 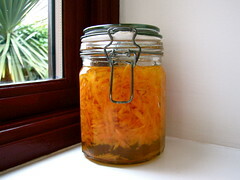 Leave in a sunny spot on the windowsill to macerate for 3 weeks, then strain through a muslin cloth and bottle. Hey presto, you have a wonderful, skin nourishing oil rich in antioxidants!